Cardiff manager Russell Slade says his side's second-half performance in the 2-1 defeat against Reading was the "worst" of his reign so far. 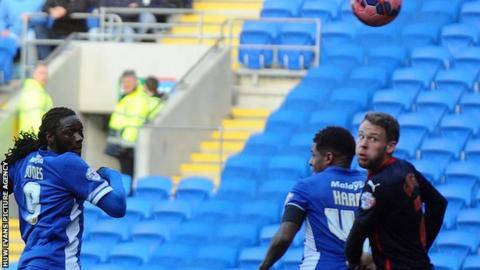 The Bluebirds led at the break against the Royals in their FA Cup fourth-round tie through a Kenwyne Jones header. Oliver Norwood equalised and many Cardiff fans in the 11,750 crowd left as soon as Hal Robson-Kanu fired the visitors in front on 86 minutes. "I'd have probably walked out myself if I was in the crowd," said Slade. "The second period it was dire from our point of view. "In the second half it looked like there was only one team that was going to push on and do it if I'm honest and that's what I am. "I thought they put us on the back foot in the first 15 minutes of the second half and we found it difficult to string two passes together under that pressure." Cardiff have lost their last three matches and are 13th in the Championship, 11 points above the relegation zone, 13 points off the play-off places - and are now out of the FA Cup. Slade says the buck stops with him for his side's recent poor results. "Today is a bad day for us and it looks as if we've taken a step in the wrong direction, and I see that and I accept that." "I'm the manager, I take all the responsibility for that," he said. "I thought we were devoid of energy, devoid of ideas in the second period and probably it is the most disappointing 45 minutes since I've been here." The Bluebirds were relegated from the Premier League last season and have struggled back in the Championship. Slade took over as Cardiff boss in October 2014 following Ole Gunnar Solskjaer's dismissal. The former Leyton Orient manager admits he cannot put his finger on the reason for the club's poor form. "I don't know. We've had a honest and frank conversation again after the game," said Slade. "I think it's very often not just one thing but an accumulation of small things. "Certainly defensive-wise we are not affecting the ball. "We've done nothing or not enough to affect that cross that's come into the box for example for the second goal [scored by Robson-Kanu]. "Do you know how many Reading strikers were in there? One. And including my goalkeeper there were six Cardiff City players in our own box and we've not dealt with that." Despite the disappointment of the Cup exit Slade says there will be pain as he bids to turn things around on the field. "There will be ups and downs in terms of trying to make that progress," he said, "but today is a bad day for us and it looks as if we've taken a step in the wrong direction, and I see that and I accept that. "It's important for us now as a group to unite and be strong, face the criticism and respond. "Our next opportunity is probably the toughest game in the calendar when we entertain Derby next week."